Prepare the jellies in two shallow dishes according to the instructions on the packet. Refrigerate until set. Preheat the oven to 180°C. Grease and line a 20 cm x 20 cm in diameter cake pan. Use an electric beater and beat the eggs, castor sugar and vanilla together until pale, creamy and light. Sift the flour and baking powder together. Sift into the egg mixture, little by little, and fold in gently using a metal spoon. Add the melted butter and fold in. Spoon into the prepared cake pan and bake for 15 – 20 minutes or until a skewer inserted comes out clean. Transfer to a cooling rack and cool completely. * To save time, use readymade sponge cakes. Mix the custard powder and the sugar together with 100 ml of the milk until smooth. Heat the remaining milk. Stir in the custard mixture and whisk over low heat until thick. Spoon into a mixing bowl and leave to cool to room temperature. Whisk in a little more milk if it becomes too thick. 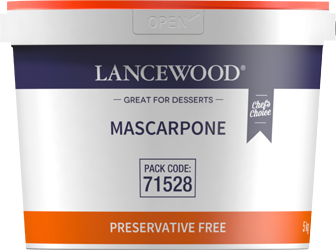 Mix LANCEWOOD® Mascarpone and LANCEWOOD® Double Cream Vanilla Yoghurt together until smooth. Cut the sponge cake into slices. Use half and place a layer in the bottom of a deep glass dish. Drizzle a little peach syrup over. Spoon half the custard on top and spread out. Top with a layer of peaches. Chop the red jelly roughly and place on top. Top with the remaining slices of sponge cake. Drizzle more peach syrup over. Top with the remaining custard and then the green jelly. 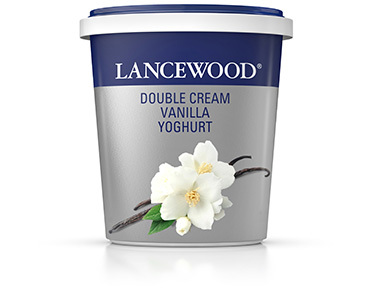 Spread the mascarpone vanilla yoghurt cream over. Top with fresh cherries and chocolate shavings.